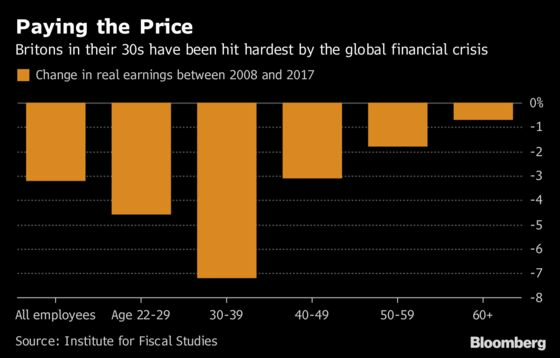 (Bloomberg) -- A decade after the collapse of Lehman Brothers heralded the worst global economic crisis since the 1930s, Britons are still paying the price. The U.K. economy is 16 percent smaller today than it would have been had it kept growing at its pre-crisis rate -- a loss of 300 billion pounds ($391 billion), according to an overview published by the Institute for Fiscal Studies Wednesday. Why such a poor performance? “Dreadful” productivity, which has grown by just 0.3 percent a year since 2008 compared with an historical trend of 2 percent. Nowhere has the effect been felt more keenly than in wage packets. Adjusted for inflation, median pay has fallen by 3 percent, with people in their 30s -- the hardest-hit age group -- now more than 2,000 pounds a year worse off. The analysis noted that rapid employment growth has helped to cushion the blow to earnings, though average household incomes would have been 4,200 pounds higher had they continued to grow at the same rate as in the decade before the crisis. The government, meanwhile, has added about 1 trillion pounds of debt, despite almost a decade of austerity that is set to continue for years to come.